When will Member Number be applied? 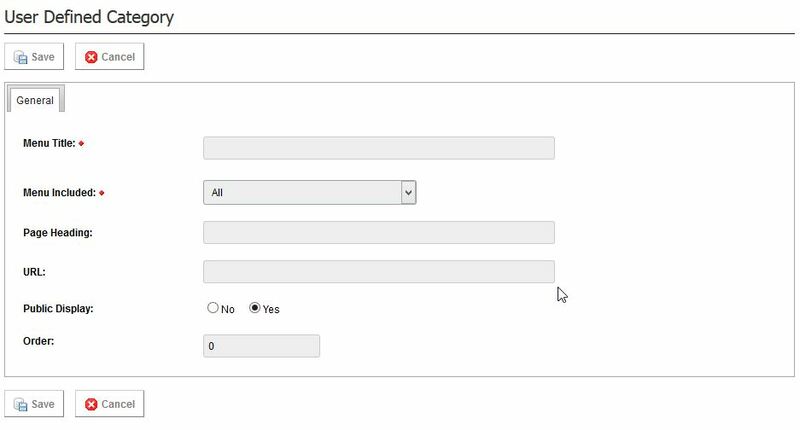 How Do I Set Up Membership Number Options? What is a Soft Bounce / Hard Bounce / Opt Out? How Do I Add Another Administrator To Access My Club's Database? Where Do I Locate A Members Financial End Date? How Do I Access One Sport Technology (OST)? Why Do Members Have To Have An Email Address? What Are The Supported Internet Browsers? Why Doesn't A $0.00 Subscription Type Display On The MemberDesq Portal? How Do I Test My Shop And Set It Live? How do I Change the TimeZone that is Set in my Shop? What Is A Meta Tag And How Can I Use It On My Shop Page? Why have I not received my funds for any Merchandise sold? How do I set up my donation items to have No Postage Required? Why Is My Merchandise Not Appearing On My Events Form? How do I include merchandise in my members registration form ? How do I alter the title of the Auction? How do I alter the end date or time of an Auction item? How do I alter the reserve price of an Auction item? How Do I Send an Individual Email? How Do I Send a Group Email? How Do I Add My Ticketholders Information to an Email? How do I create Member Only Inventory? How do I add merchandise items to my Event form? Why Is My Merchandise Not Appearing On My Event Form? What is a Club Directory? How do I set my website live? How do I get a domain name? Can I start building my site whilst I set up my domain name? Can I view my site if I don’t have the domain name set up yet? Can I view how many people have looked at my website? What Size Should My Images Be? What Format Should My Images Be In? I am not seeing what I have just added, why? Why are only certain fonts available? What is a Meta Tag and how can I use them on my Website? How do I link Twitter to my website? How do I Delete a News Item? How do I update the Website Logo? What Website Type Do I Have? How do I set up an email template? Email Templates – HTML or Plain Text? Can I find out how many people opened an email sent to an Email Database? Can I stop an email campaign? How do I include an attachment in an email? What’s a Hard Bounce/Soft Bounce/Opt Out? This area enables the administrator to create different menu options for their website. 1. Go to the Website menu, and select User Defined Data. 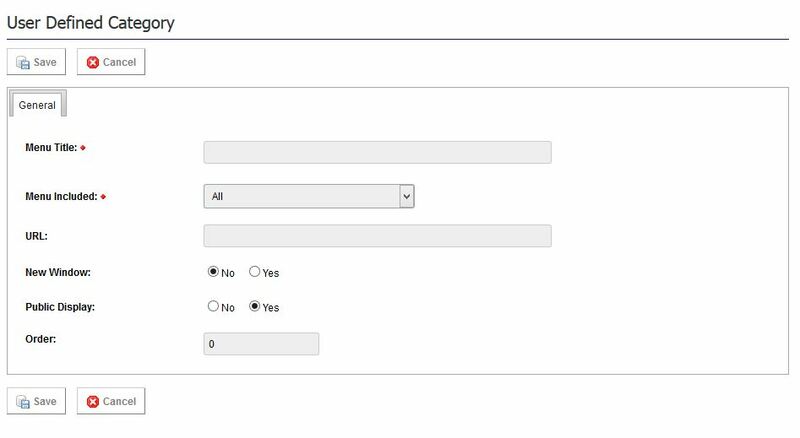 Menu Option with Custom Page: This option allows for a custom page to be created by the administrator. 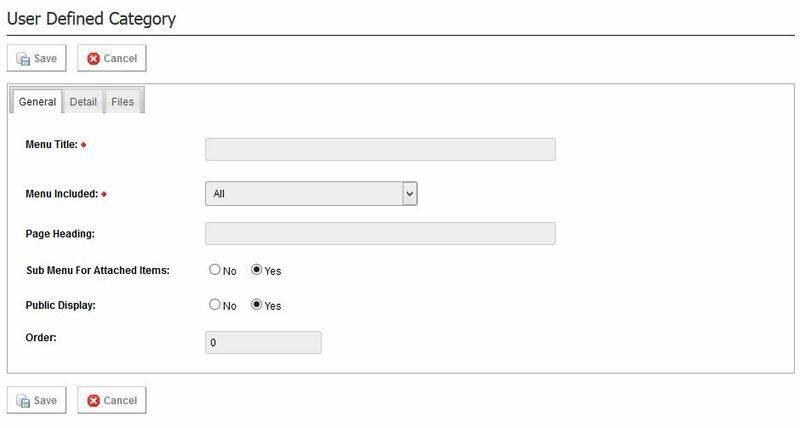 Menu Option with Custom Data: This option allows for a custom page to be created by the administrator. This menu type also allows for sub menu's to be attached to this category. Menu Option with IFrame: This will create a menu item along your website menu. This option would usually be selected to house another website page on the organisation's website. 5. Once all the relevant fields are entered, click Save. 6. To ensure that the category is displayed, click the Red Status Cross, to make it a Green Tick to activate.